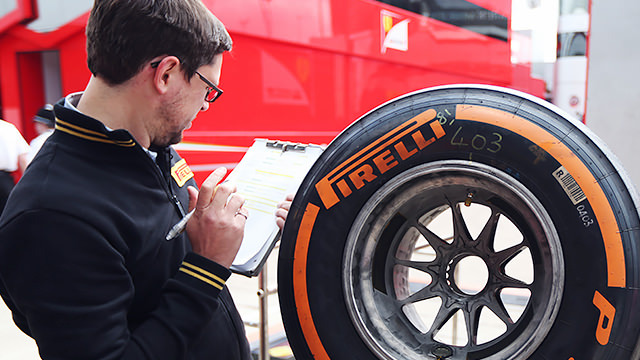 Following the eventful and at times dangerous British Grand Prix last weekend, F1 tyre supplier Pirelli Tyre S.p.A. have been conducting analysis into what caused the multiple tyre failures witnessed on Sunday. During the race Lewis Hamilton, Felipe Massa, Jean-Éric Vergne and Sergio Pérez all suffered from spectacular rubber-related disasters, while a number of other drivers experienced less acute problems. Tyre shrapnel peppered closely positioned competitors as well as necessitated the deployment of the safety car on several occasions . Given they were the story of the weekend and everything thereafter Pirelli had to respond quickly and directly to mitigate questions of compromised safety as a result of their product. They have done just that today listing a series of key points that culminated in failures at Silverstone. It had been noted earlier in the season that some teams were finding performance gains (or less performance loss) by deliberately switching left and right tyres. All the cars that suffered failures on Sunday were running this reversed configuration. Pirelli are keen to reiterate that 2013 tyres do not compromise safety if used in the correct way and that their products were not designed to be interchangeable. F1 teams are always keen to push the limits and running under-inflated tyres is a frequently used trick to find lap time. During the race broadcast camera's picked up a pitwall message for Red Bull's Adrian Newey that they would be running the remainder of the race with 2 psi of additional pressure to help reduce the risk of failure. The practice of running extreme camber angles is frequently seen on an F1 car's front tyres, but clearly also provides benefits with the rears too. Silverstone's high kerbs are the only point mentioned that are beyond the control of teams which experienced problems. In order to mitigate further problems this weekend Kevlar belt rear tyres that were tested in free practice in Canada will now be used in Germany. Pirelli had requested this change ahead of the British Grand Prix but failed to gain the required support from teams to make the switch. Additionally, during an upcoming test at Silverstone a new range of tyres, which combine 2012 structures with 2013 compounds, will be tested ahead of a planned introduction at the Hungarian Grand Prix. The new designs will be symmetrical allowing for teams to place them however they choose (or more likely, to reduce the motivation for doing so). The Italian company appear keen to take a proactive stance on reducing future problems, asking the FIA for support on matters such as obtaining real-time data during a race from each team in regards to tyre temperature, pressure and camber. Motorsport director Paul Hembery was further keen to stress the importance of relevant data when developing F1 compounds in future. "What happened at Silverstone was completely unexpected and it was the first time that anything like this has ever occurred in more than a century of Pirelli in motorsport. "These incidents, which have upset us greatly, have stressed the urgency of the changes that we already suggested - which will be introduced for free practice in Germany on Friday. "I'd like to re-emphasise the fact that the 2013 range of tyres, used in the correct way, is completely safe. What happened at Silverstone though has led us to ask for full access to real time tyre data to ensure the correct usage and development of tyres that have the sophistication we were asked to provide and extremely high performance that has lowered lap times by more than two seconds on average. While we wait for a change in the rules, we will introduce tyres that are easier to manage." Whilst Formula One's sole tyre supplier has born the brunt of criticism on matters relating to rubber recently, it's worth noting that teams, their management and their drivers all played their part in events that unfolded at the weekend. Ferrari's Fernando Alonso spent his media time after qualifying bemoaning the non-aggressive compound choice brought to the race, suggesting that the conservatism only favoured his competitors, yet was one of the first to demand the exact opposite thing less than 24 hours later. Personally I'd like to see stable rules that ensure an F1 season ends with the same basic tyre regulations that it starts with, but when mistakes have been made such that drivers are quite literally risking their lives for a bit of Sunday entertainment as they were at Silverstone, changes need to be made. With almost all of this season defined by arguments over black rounds things that keep the chassis elevated, perhaps it's time for the governing body to seriously consider if one supplier is actually enough. A sole supplier largely has the sport over a barrel, and with no alternative benchmark available, their word, their decisions and their actions are unfortunately gospel. When Michelin royally screwed up during the US Grand Prix of 2005, the blame was plain for all to see thanks to the rock solid Bridgestone's performing without issue. Who was to blame for a similar occurrence on Sunday? Pirelli say it's not them and there's no-one else to prove them wrong.